Salary Advancement and Re-Certification - Create your own Stimulus! 4 Day Curriculum Development and Alignment Sale! OSPI, ESD, District Extended Learning – Get a Raise! Thank you for attending the 2018 WSSAAA Conference. The clock hours for this conference will be available at https://www.my247ed.com and are complimentary through April 30th, 2018. You can register for the clock hours at the end of the April 25th AM meeting. District and League meetings will post just prior to the last meeting - you can complete them then. They will be complimentary through June 30th, 2018. Looking for meaningful, timely and quality professional development? No ubiquitous papers to write, no travel - just your efforts, time and our Washington State approved clock hour and 500+ Credit level courses. (All courses are approved per the WAC and RCW requirements.) Look for our co-sponsor, the Washington Federation of Independent Schools at http://www.k12.wa.us/certification/pubdocs/PrivateSchoolDistricts.pdf or at http://www.wfis.org. See how valuable professional development can be when you're working on the things that will make you a stronger educator, designed individually for YOU! Look for the new 24/7 Educational Services site redesign and enhancements optimized for professional development on your iPad, iPad Mini, netbook, tablet and phone app, putting you in control of where and when you want to learn. It's all coming soon! All bundled courses of 330 clock hours or more will receive an iPad Mini to use during the program at no cost, enabling you to work on your professional development activities where and when you want to. Additionally, when you're done the iPad Mini is yours to keep! As the school gets into its third month, now is a great time to begin to plan for your professional development, professionally and economically. This link, www.my247ed.com will take you to the 2011-2013 salary calculator so that you can see how earning clock hours or credits make a big difference in your salary for the following year based on your earned education. Below is a sample of the salary scale and what you will receive for experience and what the incentive from the state is for earning clock hours or credits. Source:http://www.k12.wa.us/SAFS/PUB/PER/SalAllocSchedule.pdf. NOTE: please use the salary calculator for other education levels at www.my247ed.com. To calculate how much you have lost, or not lost, add up the loss per year until your years of experience. Similarly, MA+45 to MA+90 are also significant. You have many choices. Many educators will choose the 150 re-certification route every 5 years to move on the salary scale. At that rate, it would take 15 years to get to x+45. The income loss on that is HUGE, nearly $-51,000. Sure you received your experience step increase, but you had potential to earn nearly $51,000 more! And once the economy turns around, these numbers are sure to increase, UNLESS of course, the legislature decides to FREEZE salaries where they are better stated, where YOU are on the salary scale, as it almost did in 2011. Run the numbers for yourself. Just remember that in most districts an MA+20, MA+35, MA+40 (or your educational level) is always rounded DOWN to the experience step. So that MA+20, MA+35, MA+40 is paid to you as an MA+0. Earn now, and pay later, no interest, no credit check, no hassle. In many instances, the program costs will be less than your earned salary increase. In economic terms that means that your ROI (return on investment) in yourself may result in more than a 100% return in a single year. Our program offers a 10% payment option with the balance deferred to October 1, 2013, and your choice of a balance payoff in full OR paying off the balance over the next 12-24 months with our payment plan selections for those looking to earn 150 clock hours or more. Essentially you can either save now to pay off next year, or pay for your earned salary increase with next year's salary! It's up to you. Want to work with a group or a colleague? Let us know and we can customize a program to meet your exact needs at a reduced rate. If you're already working with one of our building representatives, please contact them directly for any other specials. LIKE us in FACEBOOK. Search MY247ED.COM for a chance to win an iPad Mini! Get started NOW and start earning your hours NOW at www.my247ed.com. CLARIFICATION: OSPI requires that you COMPLETE your courses no later than June 30th of the year your certificate expires. We recommend that you get your records in the "mail" to OSPI by June 30th, but you may certainly work on courses right up to June 30th. Integrating Technology into your Existing Curriculum using the iPad or Kindle Fire for 60 clock hours. This course INCLUDES your choice of an iPad, Kindle Fire or Netbook! We have a limited number of iPads, Kindle Fires and Netbooks and will be made available on a first-come basis. Click here to request information on this course and which platform you're interested in. JUNE 30th RECERTIFICATION DEADLINE time is running out! Need last minute clock hours for the June 30th deadline? No hassles, no travel, no busywork! For those who completed their re-certification for this June 30th, may complete the next 150 clock hour requirement this summer (after July 1), and your certification will have an added 5 years. That's up to 10 years of continued certification! Get started now... Whether you're 20 clock hours short or 450 clock hours short of the next step, NOW is the time to start. Most District's require completion of all courses prior to September 30th. If you have the time, you can get it done WITHOUT busywork! Remember, if you're an MA-1 to MA-44, you're only an MA-0* on the salary scale. Same if you're an MA-46 to MA-89, you're only an MA-45* on the salary scale!!! That could cost you nearly $4,000 per year, EVERY year you put it off!!! Looking for meaningful, timely and quality professional development? No ubiquitous papers to write, no travel - just your efforts, time and our Washington State approved clock hour and 500+ level courses. See how valuable professional development can be when you're working on the things that will make you a stronger educator, designed individually for YOU! Check out the www.my247ed.com exclusive salary* calculator. It calculates from your current salary to where you'd be next year with your earned clock hours or credits! Find out how close you are from your next raise. Don't end up only wishing you had. https://www.my247ed.com/reports/salary. We're the ONLY educational organization that lets you earn clock hours or credits first, and then pay for them later - usually from your salary increase! Contact us directly at 509-448-0603. See how easy it is and how valuable it will be to you. Example bundled courses: 10-20% down, deferred to October 1, 2012 and you may pay off the balance with NO interest and NO added fees . You may even choose to finance the courses after October 2012 and divide the remaining balance by how many payments you would like to make. (Deferment to October 2013 also available) For more information, please contact information@my247ed.com. Would you like to earn more than 150 clock hours or more this year for recertification or salary advancement? Discounted bundled pricing is available and all bundles include our technology courses for free! For more information, please contact information@my247ed.com. Selected bundles include a NETBOOK or Kindle Fire!!! Your continued word-of-mouth recommendations is our best advertising and we want to reward you. Please let us know if you'd like to join our resellers program to earn some additional ongoing compensation. Otherwise, please encourage those that sign up and enroll to use your name as the referrer. Become a building representative and earn up to 5% on every enrollment. Let us know you're interested and we'll put you together with our sales team! Get Started Now! All courses are offered as Washington State approved clock hours or credit per WAC 181-85 requirements. Guaranteed!!! 24/7 Educational Services and its co-sponsor(s) Washington Federation of Independent Schools (www.wfis.org) to offer Washington State Approved Clock Hours in compliance with all requirements of OSPI. Courses are also accredited by Northwest Nazarene University. Courses are also accredited for college/university credit(s). See the approved provider list at http://www.k12.wa.us/certification/clockhours.aspx. Select Private School Associations and the year. GET A FREE KINDLE FIRE with this 150 Clock hour bundle - LIMITED TIME. Save 5% on earning 150 clock hours get a Free Kindle Fire and no payment due until July 1, 2012! For those that are looking to earn at least 150 clock hours, you'll receive 5% off online rates, PLUS receive a brand new Kindle Fire. In addition you can defer your entire payment for your courses until July 1, 2012 at no cost! This is a limited time offer and will expire at midnight April 30, 2012. To enroll, you must click this link: information@my247ed.com and request this offer. This is a one-time offer and is not valid with any other discounts, offer, or prior sale. For those who completed their re-certification for this June 30th, can still take advantage of this offer. However, per WAC requirements, your enrollment won't be active or available until July 1, 2012. If you complete the next 150 clock hour requirement this summer, your certification will have an added 5 years. That's up to 10 years of continued certification! 24/7 Educational Services and its co-sponsor(s) Washington Federation of Independent Schools (www.wfis.org) to offer Washington State Approved Clock Hours in compliance with all requirements of OSPI. Courses are also accredited for college/university credit(s). See the approved provider list at http://www.k12.wa.us/certification/clockhours.aspx. Select Private School Associations and the year. Look for the new 24/7 Educational Services site redesign and enhancements optimized for professional development on your netbook, tablet and phone app, putting you in control of where and when you want to learn — coming soon! Below is a sample of the salary scale and what you will receive for experience and what the incentive from the state is for earning clock hours or credits. Source: http://www.k12.wa.us/SAFS/PUB/PER/SalAllocSchedule.pdf. NOTE: please use the salary calculator for other education levels at www.my247ed.com. You have many choices — many educators will choose the 150 re-certification route every 5 years to move on the salary scale. At that rate, it would take 15 years to get to x+45. The income loss on that is HUGE, nearly $-51,000. Sure you received your experience step increase, but you had potential to earn nearly $51,000 more! And once the economy turns around, these numbers are sure to increase — UNLESS of course the legislature decides to FREEZE salaries where they are — better stated, where YOU are on the salary scale, as it almost did this year. Run the numbers for yourself. Just remember that in most districts an MA+20, MA+35, MA+40 (or whatever educational level) is always rounded DOWN to the experience step. So that MA+20, MA+35, MA+40 is paid to you as an MA+0. In many instances, the program costs will be less than your earned salary increase. In economic terms that means that your ROI (return on investment) in yourself may result in more than a 100% return in a single year. Our program offers a 10% payment option with the balance deferred to October 1, 2012, and your choice of a balance payoff in full OR paying off the balance over the next 12-24 months with our payment plan selections for those looking to earn 150 clock hours or more. Essentially you can either save now to pay off next year, or pay for your earned salary increase with next year's salary! It's up to you. Additionally, all courses of 130 clock hours or more will receive a netbook or web enabled tablet for use during the program at no cost, enabling you to work on your professional development activities where and when you want to. At the end of the program you can return the netbook or tablet (in working order), or keep it for a small fee. If you're earning over 300 clock hours, the netbook or table is yours to keep. If you're looking to work with a colleague additional discounts may apply. This offer is LIMITED to the first 20 Registrations, so to get started click here information@my247ed.com and let us know what your teaching assignment (Elementary, Middle, Secondary and area(s) of instruction) along with how many clock hours you're looking to earn. This offer is only available through 24/7 Educational Services directly. If you're already working with one of our building representatives, please contact them directly for any other specials. Likewise, if you're interested in becoming a building representative, please let us know! As you know, salary STEPS were "on the table" in this year's legislative session. Fortunately they were not touched by the budget cuts we'll all feel. As you may have seen at www.washingtonea.org, without the STEPS, educators may have lost up to $200,000 over the course of their career. What was not stated was the educator not taking advantage of the salary STEPS sooner than later, the result is only slightly less! Don't wait. The next time the legislature has budgets to cut, you'll be glad you're maxed out on the salary scale. Whether you're 20 clock hours short or 450 clock hours short of the next step, NOW is the time to start. Most District's require completion of all courses prior to September 30th. If you have the time, you can get it done WITHOUT busywork! Remember, if you're an MA-1 to MA-44, you're only an MA-0* on the salary scale. Same if you're an MA-46 to MA-89, you're only an MA-45* on the salary scale!!! That could cost you nearly $4,000 per year!!! JUNE 30th RECERTIFICATION DEADLINE — time is running out! Need last minute clock hours for the June 30th deadline? Enrollment is immediate and you may begin right away. No hassles no travel, no busywork! Check out the www.my247ed.com exclusive salary* calculator. It calculates from your current salary to where you'd be next year with your earned clock hours or credits! Find out how close you are from your next raise. Don't end up only "wishing you had." https://www.my247ed.com/reports/salary. We're the ONLY educational organization that lets you earn clock hours or credits first, and then pay for them later - usually from your salary increase! Contact us directly at 509-448-0603. See how easy it is and how valuable it will be to you. Example bundled courses: 20% down, deferred to October 1, 2011 and you may pay off the balance with NO interest and NO added fees . You may even choose to finance the courses after October 2011 and divide the remaining balance by how many payments you would like to make. (Deferment to October 2012 also available) For more information, please contact information@my247ed.com. Would you like to earn 150 clock hours or more this year for recertification or salary advancement? Discounted bundled pricing is available and all bundles include our technology courses for free! For more information, please contact information@my247ed.com. Selected bundles get a FREE NETBOOK!!! Get Started Now! All courses are offered as Washington State approved clock hours or credit per WAC 181-85 requirements. — Guaranteed!!! Congratulations on a completion of the 2009-2010 school year! If you're spending this spring and summer doing school related activities, why not turn your efforts into clock hours or credit? No ubiquitous papers to write, no travel - just your efforts, time and our courses. See how valuable professional development can be when you're working on the things that will make you a stronger educator, designed individually for YOU! We DO accept purchase orders! All courses and offerings include a full receipt for reimbursement of professional development dollars. We're the ONLY educational organization that lets you earn clock hours or credits first, and then pay for them later - usually from your salary increase! Contact us directly at 509-448-0603. See how easy it is and how profitable it will be to you. Example bundled* courses: 20% down, defer to October 1, 2010 and pay off the balance with NO interest and NO added fees. Choose to finance the courses after October and simply divide the remaining balance by how many payments you would like to make and add $20 per month. For more information please contact us at information@my247ed.com. If you're looking to earn just a few hours or interested in making taking courses your summer job and earn a $3,000 to over $6,700 raise this summer, please contact us at 509-448-0603 directly for discounted course bundles*. Need to earn 150 hours this summer or more? Bundle* pricing is available from $1450, and all bundles* include our technology courses for free! For more information please contact us at information@my247ed.com. Selected bundles get a FREE NETBOOK!!! We guarantee there's NO BUSY-WORK. *Bundled courses are 150 clock hours or more. Pricing is only available by calling 509-448-0603. Your continued word-of-mouth recommendations is our best advertising and we want to reward you. Please let us know if you'd like to join our resellers program to earn some additional ongoing compensation. Otherwise, please encourage those that sign up and enroll to use your name as the referrer so we can send you out a Starbucks or GAS card. Become a building representative and earn up to 5% on every enrollment! Need last minute clock hours for the June 30th deadline? Enrollment is immediate and you may begin right away. No hassles, no travel - no gas!! Please check the www.my247ed.com website for all of the different and continuously added courses and conference list for this summer, including any OSPI Summer Institutes. We'll once again offer the EXACT same clock hours for a fraction of the price. You need not attend all hours, but you must attend at least three. Got and Idea for Us? We'd love to hear it. Please let us know at 509-448-0603 or support@my247ed.com with idea in the subject line! IMPORTANT - take advantage of the Forms and Reports tab in the myAccount section. We pre-fill the courses you took through us and as available though our approved sponsors, directly on to the required state forms for you. Then all you need to do is review it, sign it and send it in! CAUTION - If you choose not to use our forms, please make sure that you list the name of the approved sponsor exactly as written on your completion forms. DO NOT write 24/7 Educational Services as the approved sponsor, or your renewal form may be delayed or not accepted by OSPI until you correct your error. 24/7 Educational Services and its co-sponsor(s) Washington Federation of Independent Schools (www.wfis.org) offer Washington State Approved Clock Hours in compliance with all requirements of OSPI. Courses are also accredited for college/university credit(s). See the approved provider list at http://www.k12.wa.us/certification/clockhours.aspx. Select Private School Associations and the year. May NETBOOK Mania is here! No salary increase next year? EARN your salary increase next year NOW!!! Check out the www.my247ed.com exclusive salary calculator. It calculates from your current salary to where you'd be next year with your earned clock hours or credits! Find out how close you are from your next raise. Most salary advancements are between $3,000 to $6,700. Don't end up only "wishing you had". https://www.my247ed.com/reports/salary. We guarantee there's NO BUSY-WORK. Enrollment is immediate and you may begin right away. No hassles, no travel - no gas!! Need to earn 150 hours this spring and summer or more? Bundle* pricing is available from $1400, and all bundles* include our technology courses for free! For more information please contact us at information@my247ed.com. Your continued word-of-mouth recommendations are our best advertising and we want to reward you. Please let us know if you'd like to join our resellers program to earn some additional ongoing compensation. Become a building representative and earn up to 5% on every enrollment! The best grossing representative earns a brand new APPLE iPAD!!! Contact Tod directly to get info and signed up! We're the ONLY educational organization that lets you earn clock hours or credits first, and then pay for them later - usually from your salary increase! Contact us directly at 509-448-0603. See how easy it is and how profitable it will be to you. Example bundled* courses: 10% down, defer to October 1, 2010 and pay off the balance with NO interest and NO added fees. Choose to finance the courses after October and simply divide the remaining balance by how many payments you would like to make and add $20 per month. For more information please contact us at information@my247ed.com. my247ed.com — Learn More. Earn More. Need to earn 150 hours this summer or more? Bundle* pricing is available from $1375, and all bundles* include our technology courses for free! For more information please contact us at information@my247ed.com. Your continued word-of-mouth recommendations are our best advertising and we want to reward you. Please let us know if you'd like to join our resellers program to earn some additional ongoing compensation. Otherwise, please encourage those that sign up and enroll to use your name as the referrer so we can send you out a Starbucks or GAS card. Become a building representative and earn up to 5% on every enrollment! We're the ONLY educational organization that lets you earn clock hours or credits first, and then pay for them later - usually from your salary increase! Contact us directly at 509-448-0603. See how easy it is and how profitable it will be to you. Example bundled* courses: 20% down, defer to October 1, 2009 and pay off the balance with NO interest and NO added fees. Choose to finance the courses after October and simply divide the remaining balance by how many payments you would like to make and add $20 per month. For more information please contact us at information@my247ed.com. Need last minute clock hours for the June 30th deadline OR courses for salary advancement? Enrollment is immediate and you may begin right away. No hassles, no travel - no gas!! If you're looking to earn just a few hours or interested in making taking courses your summer job and earn a $3,000 to over $6,700 raise this summer, please contact us at 509-448-0603 directly for discounted course bundles*. Need to earn 150 hours this summer or more? Bundle* pricing is available from $1375, and all bundles* include our technology courses for free! For more information please contact us at information@my247ed.com. Have you or a colleague of yours been reassigned to a different grade level or subject area? Want to earn clock hours for all of your preparation for next school year? No problem. Contact 24/7 at 509-448-0603 or at information@my247ed.com with reassigned in the subject line. We can get you going and set for earning the clock hours or credits for all your work this summer. Clock hours can not be retroactive, so don't delay! Want to advance on the Pay-Scale (The only way to do so in Washington State is to earn hours/credits)? We're the ONLY educational organization that lets you earn clock hours or credits first, and then pay for them later - usually from your salary increase! Contact us directly at 509-448-0603. See how easy it is and how profitable it will be to you. Example bundled* courses: 20% down, defer to October 1, 2009 and pay off the balance with NO interest and NO added fees. Choose to finance the courses after October and simply divide the remaining balance by how many payments you would like to make and add $20 per month. For more information please contact us at information@my247ed.com. my24/7ed.com — Learn More. Earn More. Don't let your teaching certificate expire. Earn the clock hours or credit(s) you need with www.my247ed.com! By taking courses that help to sharpen your skills, you will earn clock hours and keep your certificate current. Over the past 5 years www.my247ed.com has provided thousands of courses to educators to help them do just that. www.my247ed.com courses are great for any educator looking for quality professional development, to meet re-certification needs or to move on the salary scale. Courses are also available in bundles, allowing you to save up to 15%. ALERT!!! For a limited time, course bundles of 150 clock hours or more for re-certification may defer payment until October 2009. 10-20% down is required and no payments or interest are due until October 2009. Then pay off the balance over the next 12 months! Contact us at 509-448-0603 or at information@my247ed.com with your subject area, grade or teaching assignment and how many hours you're looking to earn. So don't delay. Time is ticking away! Why do educators use www.my247ed.com? Frozen salary leaving you cold? my247ed.com can defrost it for you. The only way to move on the Washington State pay scale for the foreseeable future is to earn credit/clock hours and www.my247ed.com makes this a snap. By taking courses that help to sharpen your skills, you will earn credits that will move you on the pay scale. Over the past 5 years www.my247ed.com has provided thousands of courses to educators to help them do just that. How much additional money can you earn you ask? Please see the following salary calculator https://www.my247ed.com/reports/salary to determine how much. On average, increases from credit/clock hours and experience is $4,500 per year. my247ed.com courses are great for any educator looking for quality professional development, to meet re-certification needs or to move on the salary scale. Courses are also available in bundles, allowing you to save 10-20%. ALERT!!! For a limited time, course bundles of 150 clock hours or more for salary advancement may defer payment until October 2009. 10-20% down is required and no payments or interest until October 2009. Then pay off the balance over the next 12 months! Contact us at 509-448-0603 or at information@my247ed.com with your subject area, grade or teaching assignment and how many hours you're looking to earn. Don't get stuck in a salary freeze (or decrease). EARN your raise for next year now. Get yourself moving on the salary scale by making the commitment to get to the next salary column! The approximate difference between MA+0 and MA+45 or MA+45 to MA+90 using last year's scale was +/-$4500. Don't sit back and wait and wait and wait. Earning only 150 clock hours every 5 years would require 15 years to get to MA+45, or 30 years for MA+90. If the approximate salary increase is even $3000 per year, that's a lot of salary to be missed. Let alone what the difference in retirement would be. Enroll in one of our many different clock hour or credit hour bundles of 150 or more, and ask how to get a copy of Dan Otter's book Teach and Retire Rich, Financial Education for Educators, for FREE. As always, our bundled courses are customized and meaningful for your individual needs and requirements. There's no busy work, just content and a resulting product you can use! Plus, because you may want to include technology into your courses, we'll include our entire technology CD. By itself, that's 400 clock hours. Sign-up now and take advantage of our deferred payment options. There's no credit check and you can spread out your payments for up to 24 months!!! 20% down and defer* payments until October 2010!!! This is a limited time offer and may end at anytime. To get started, contact 24/7 Educational Services at 509-448-0603 or email us at information@my247ed.com. Thank you for your business and your continued recommendations to your colleagues! YES, we also have the WAC required Issues of Abuse course available!!! We are pleased to again offer two (2) college credit (550 level) for your participation in the People to People training and travel programs. The course, Cultural Diversity: Education Travel Methods, is available for two (2) semester credits. Two semester credits is the SAME as three (3) quarter credits. The course compliments everything you're doing now as your prepare for your travel and is NOT designed to be a busywork course! Last year we had over 50 educators take advantage of the credit offering. Best of all, you may choose your completion date. Many educators have a recertification or renewal requirement or may want to advance on the salary scale (where available). By choosing your own completion date you are in control. For those that wish to meet the requirement prior to the travel component, we can accommodate you as well. For more information or to get started visit: http://ptp.my247ed.com. If you have any questions, please feel free to contact us directly at the number below or through People to People! For December 2008 only, ZERO down and ZERO payments until October 2009 gets you started earning hours or credits for your next re-certification or salary advancement requirement. This is the best offer available as the cost for the courses may be completely offset by your next raise! This offer is available only for those educators needing to earn 150 clock hours or more. PLUS, take an additional 10% off all courses!!! In order to qualify for this program, MUST "click here to email us" to save your rate OR you MUST contact us directly at 509-448-0603. This is a limited time offer and expires this month. Share (forward) this email with your friends and colleagues and you'll receive $50 for each friend or colleague that enrolls in the ZERO down offer. When they call or email, please have them include your name. It's that simple. Please use the salary calculator to see how you can EARN your next raise much faster and more easily than you ever thought! Please note that the salary calculator uses last year's salary information as 2009-2010 salary information is not yet published. Go to www.my247ed.com to sign-up or log-in. A new series of courses, "Content Development, Content Alignment and Content Implementation" will be available this month by 24/7 Educational Services and its Approved Washington State sponsors. Approved sponsor: Washington Federation of Independent Schools www.wfis.org. OSPI: http://www.k12.wa.us/certification/clockhours.aspx, choose Private School Associations/Conferences/Dioceses 2008-09. The series offers educators the ability to earn from 3 to 900 Washington State Approved clock hours. (Credit hours are also available) Guaranteed. The courses in this series are unique in that the content you create, modify and enhance may be made available to other educators and/or students. When this happens, you get paid. Of course, you may choose to only take the course and not make it available to others, but chances are that you'll probably end up with something that's not too far off from being ready to be published! Imagine that - the content that you develop gets used beyond your classroom. While the content you create may be centric to Washington State and your specific needs, content can also be modified for National delivery. Either way, now, as you're developing your curriculum, you can earn clock hours for re-certification or pay scale advancement. Now is the best time to get started, as much of what you're doing or may be doing can be used as part of your courses. Get started now! Go to www.my247ed.com to sign-up or log-in. To sign-up for the credit, go to http://ptp.my247ed.com and follow the prompts to enroll. The credit offering will not be available after 8/31/08 for your 2007-2008 travel. Feel free to contact us directly at 509-448-0603 for questions or through People to People login. Congratulations on a completion of the 2007-2008 school year! We DO accept purchase orders! All courses and offerings include a full receipt for reimbursement of professional development dollars. We're the ONLY educational organization that lets your earn clock hours or credits first, and then pay for them later - usually from your salary increase! Contact us directly at 509-448-0603. See how easy it is and how profitable it will be to you. If you're looking to earn just a few hours or interested in making taking courses your summer job and earn a $3,000 to over $6,700 raise this summer, please contact us at 509-448-0603 directly for discounted course bundles. Need to earn 150 hours this summer or more? Bundle pricing is available from $1350, and all bundles include our technology courses for free! Bundle pricing is only available by calling 509-448-0603. Your continued word-of-mouth recommendations is our best advertising and we want to reward you. Please let us know if you'd like to join our resellers program to earn some additional ongoing compensation. Otherwise, please encourage those that sign up and enroll to use your name as the referrer so we can send you out a Starbucks or GAS card! Please check the www.my247ed.com website for all of the different and continuously added courses and conference list for this summer, including the 2008 OSPI Summer Institute. We'll once again offer the EXACT same clock hours for a fraction of the price. You need not attend all 20.5 hours, but you must attend at least three. Take Courses Now, Pay Later! How close are you to that next pay raise? Check out the Washington State Salary Calculator and see how much more you can earn. Is money tight right now to pay for courses? No problem. Enroll in any of our course bundles of 150 to 450 clock hours (or credit equivalent) now and defer payments until October 2008*. That's AFTER your salary raise. You cannot afford to miss this special offer. Contact us at 509-448-0603 or support@my247ed.com. We'll give you up to 20% more for your tax-rebate check when you use it to take any of our course bundles! Check out our course catalog for newly added courses. Need to finish those last few clock hours, or maybe all 150 of them, before June 30th? We can help. Visit www.my247ed.com and choose from our extensive catalog of over 300 Washington State Approved clock hours, or contact us for a customized solution for you! 509-448-0603 or support@my247ed.com. Contact us directly if you're interested in being a school, district or regional referral partner. You can earn hundreds even thousands of dollars every month. On average, our partners earn $800 per month. 509-448-0603 or support@my247ed.com. We appreciate your business and look forward to assisting you meet your educational needs. *10%-20% down required, no payments and no interest. Please feel free to forward this email to your colleagues!! We are pleased to announce our extended partnership with People to People Ambassadors Programs. In addition to traveling the world, you can now earn up to 150 clock hours or credits for your experience – every year! Interest Free Financing – Take courses now, pay later! For those educators looking to earn more than 150 clock hours between now and the end of the summer, we’re offering interest-free financing* until October 1, 2008. It’s yet another example of the 24/7 Educational Services difference. Bundled Courses Limited Offering and no ESD fees! Right now we’re offering a 10% discount on any of our clock hour courses including our extremely popular 150, 300 and 450 clock hour bundles which include our entire technology CD. Our courses are designed not to require you to spend time in front of a computer; instead you work where and when you want to, online and offline. See for yourself how additional clock hours or credits can enhance your professional development, salary and retirement. MAX out now! Click here to launch the salary calculator. All of 24/7 Educational Services’ courses may be used as part of YOUR elective courses. Our courses are readily available for meet your schedule, are never canceled and generally cost less than those offered by the college or university. For those of you that have enjoyed the quality, convenience and relevance of one or more of our courses, 24/7 Educational Services would like offer you the opportunity to begin earning revenue from each of your referrals that enroll in our courses. In the past 12 months, individual educators just like you from all over the state have consistently earned over $700 cash per month. That’s a pretty good return for simply sharing our services with your colleagues. Plus, we’ll provide you with all our marketing material – cups, flyers, we’ve even customized marketing materials specifically as requested by our referral partners. Click here to become a referral partner and begin earning revenue immediately. Private School and ACSI school educators looking for re-certification packages or courses only, click here to receive WFIS and ACSI pricing. Remember, log into your account and click on forms and reports to access your 2007 professional development receipts for tax purposes. Receipts may be available on individual courses if enrolled separately, or all in one if enrolled as a bundle. For the past five years, 24/7 Educational Services in partnership with the Washington Federation of Independent Schools (WFIS, www.wfis.org), the Freeman School District in Spokane (www.freemansd.org or www.freeman.wednet.edu) and many other Washington State approved clock-hour entities, has been assisting educators meet their individual educational goals and requirements. With a catalog of over 300 clock hour courses, and over 90 credit hour courses (available as quarter credits or semester credits), for you to choose from, 24/7 Educational Services has provided the perfect solution for the educator looking to meet individual requirements, including moving on the salary scale. * 20% down payment required. Interest is not accruing prior to October 1, 2008. After October 1, 2008 interest will be assessed at 12% for up to 24 months on any outstanding balance or until the balance is paid in full. Your account balance, payment and pay-off information is available within your account. Because all financing is done in-house, there are no banks, no credit checks or pre-payment penalties – our courses and your work! Click here to launch the salary calculator. Earn your salary increase now and pay for it later. 24/7 Educational Services LLC is please to announce its deferred payment, interest free payment program for Washington State educators - the only one of its kind in Washington*. Enroll in any course(s) from www.my247ed.com, in any clock hour increments, 3 to 900 clock hours or credit equivalent, and pay only 10% down and defer all payments until after your October salary increase**. This offer may also be used for June 30th renewal. Many educators would like to earn their next pay-scale step, but may find it cost prohibitive, especially on a fixed income. See what a tremendous impact maxing out on the salary-scale can do to your retirement program. In fact, sign-up for any bundle of 150 clock hours or more and receive Dan Otter's Teach and Retire Rich book for FREE. It's a great resource as you consider your financial planning! By getting started today, the "clock starts ticking" upon enrollment! That means that you may begin earning clock hours right away, and not have to allocate specific times and dates to meet needs and requirements that you wish hadn't been put off. Offer vaid through February 2007. Visit us and see what www.my247ed.com and its Washington State Approved clock hour sponsors (Washington Federation of Independent Schools www.wfis.org and <?xml:namespace prefix = st1 ns = "urn:schemas-microsoft-com:office:smarttags" />Freeman School District www.freeman.wednet.edu) can do to assist you in meeting your individual educational needs. 1) The redesign of the www.my247ed.com site. Simpler, faster and more intuitive. 3) Delivery of our complimentary coffee cups to your school and staff begins in January. For more information on this, please visit www.my247ed.com/coffee. We thank you for your business and your continued referrals to your colleagues. With your recommendations we have delivered more than 2,500 courses this year alone!!! *please call (509-448-0603), email (information@my247ed.com) for details or simply choose the deferment option at checkout. **you must complete your courses and hours per your district's pay-scale deadline. Coming Soon - Educator and Family Friendly, Ad Free Blogging! Don't miss out on the incredible savings when it comes to clock hours at the OSPI Summer Conferences, as compared to your local ESD. You'll save at least 50% of your clock hour fees (what you pay for the clock hour receipt). In addition with www.my247ed.com, you'll receive 24/7 access to your records, reports and receipts as well as free transcripts. Beginning <?xml:namespace prefix = st1 ns = "urn:schemas-microsoft-com:office:smarttags" />August 1, 2006, you'll now have an additional choice of how to pay for your hours or credits - lump sum or a payment plan. Because many times (if not always) your pay increase doesn't begin until October, you can, if you wish, defer your payments until then! That's right - you can earn the clock hours and/or credits and pay nothing until after October. And yes, you'll have been granted your clock hours or earned your credits before your school deadline. To take advantage of this offer add your course(s) to your cart and choose from the options at check out! Wondering what a salary increase can do for your retirement? Dan Otter's Teach and Retire Rich course has been very popular this last year. Written by an educator, Dan's book has been written about extensively and positively in such publications as Forbes and the Wall Street Journal (www.403bwize.com). The straight forward and easy to understand format, along with activities specific to your situation will simply and easily allow you to see different possibilities! See how quickly MAXING out on the pay-scale not only pays for itself, but also increases future returns. The bottom-line - if you're not MAXED out - you need to get there as soon as possible. If you haven't already, now's the time to get started on next year's pay raise! Whether you need clock hours or credit hours www.my247ed.com can easily and usefully help you meet any requirement that you may have - up to 450 clock hours this summer alone! You can be earning clock hours for nearly anything - from room preparation, pilot programs, book or text review (especially, but not limited to, early education and librarians) reading and reviewing professional reviews and publications, book clubs, creating and/or enhancing curriculum - for both students and educators, bulletin boards, curriculum integration, curriculum alignment, technology related activities and even attending in-state and out-of-state conferences and workshops or trips! Your options are almost unlimited - as www.my247ed.com is the ONLY entity to customize individual solutions to meet your individual needs. No more taking courses just to take them. Start earning clock and credit hours for things that matter to you! These are great courses designed to meet your specific and individual needs. Plus, these courses can be taken again and again, as each time your content and focus may be a bit different. And when you're done, you have something useful to show for your time and effort. Go to www.my247ed.com and choose the Curriculum Development and/or Alignment course for more information. You can even take a FREE 3 hours course, just to see if you like it! All 150 clock hour bundles and credit bundles now INCLUDE the ENTIRE technology CD suite. That's a savings of over $1000. Congratulation to those that have met the June 30th re-certification deadline! The last thing you probably want to think about is having to earn more clock or credit hours. But, what if your certificate could be extended another 5 years - so you didn't have to worry about it until 2016-2017? You can! Earn all 150 clock hours or 15 credits this summer with www.my247ed.com and re-submit your application to OSPI and you're set! Then start going to and taking professional development offerings that are important and interesting to you! Coming Soon!!! Educator and Family Friendly Ad Free BLOGGING! It's almost here. After many requests, comments and suggestions from our educators nationwide, www.my247ed.com will be rolling out its educator and family ad free blog site. Educators have often struggled to find sites that are appropriate for their district, schools, students and parents, until now. In addition to the ability to use the blog, educators may also earn clock hours and/or credit hours for setting up, creating, maintaining and/or using. We think you'll find it's the simplest and most intuitive blog site available for educators anywhere! Preview at: www.my247ed.com/blog! We've had a lot of iPOD winners announced. Keep checking to see what's new - and see if you too are a winner. A new winner is announced every 72 hours! For those Washington State schools and districts interested, www.my247ed.com is offering your school the opportunity to enjoy a year's supply of disposable coffee cups! Reduce the staff room sink pile-up and just throw your cup away. It's that easy. For details and to enroll your school, click here, www.my247ed.com/coffee. For those schools unable to accept something for free, you may receive the same offer and pay only for shipping and handling. See why when we say "your professional development, conveniently delivered," we mean it! It's about choice, quality, availability and convenience - with more than 375 on and offline Washington State Approved clock hour and credit hour courses that you may not have heard about. AND pay NO ESD fees! Look for a cleaner and easier to navigate look and feel for the www.my247ed.com website coming this fall. As always, we appreciate your business and your continued referrals and recommendations to your colleagues. Please let us know if you have any questions or comments! These forms are available from within your account by clicking on the forms and reports link on the left (in your account). The importance of using these forms, especially the SPI/CERT 1211 is that if you mistakenly or inaccurately label any of the information - especially the sponsor, your application for renewal will be returned to you by OSPI. Again, these forms are pre-filled for your convenience -just print out and sign. It can't get any easier. As thousands of educators have also done, please feel free to add courses, including credits, not taken through www.my247ed.com in the "other courses/conference records" at the bottom of the myaccount section. These courses too will print directly onto the State forms! Please take a moment to check your contact information within the "preferences" section of your account. You can update all of your information there to accurately reflect the information to be printed on the State forms. Additionally, please update your email address, if necessary, to ensure that you receive notification(s) of your completed forms. NOTICE: your new email address will then become your new username. Your password will not change. If you have any questions or suggestions, please don't hesitate to contact us! There are only 22 days left until June 30th. For those looking for last minute clock hours or credits to meet the June 30th re-certification deadline we have over 375 online and offline courses for you to choose from. These courses provide you with the flexibility and content that meets your needs and your schedule. Earn from 3 to 450 clock hours or equivalent credits - quickly and easily - and something you can actually use. No busywork and NO added ESD fees! If you're looking for something specific to you and would like to earn 3 to 450 clock hours, please contact us directly at information@my247ed.com or via phone at 509-448-0603. During June we're extra available! Until June 30th, enrollees in our Curriculum Development and Alignment courses can receive the entire Technology CD for FREE. For those educators not wanting or needing to take courses until July 1, take advantage of pre-registration in our 150 clock hour bundle or any course(s) NOW and we'll enroll you automatically on July 1st. For those looking to move on the pay-schedule for next year, now's a great time to get enrolled! Start earning clock hours and/or credit as you begin thinking and planning for next years changes - whether you'll have a different assignment or just adjusting your curriculum. Please share this email with your colleagues - there's not a better, easier or more convenient way to earn clock hours or credits! As always, ALL www.my247ed.com courses are Washington State Approved by Freeman School District #358 (www.freeman.wednet.edu) and WFIS (www.wfis.org) - GUARANTEED. Questions? Please don't hesitate to contact us directly. Save 10% now on all non-bundles and non-conference courses from www.my247ed.com. That's a selection of more than 350 online and offline courses. Courses range from 3 hours to 450 clock hours and equivalent credit hours. To get started, log on to www.my247ed.com and use the code may06 at check out! We are extending our 150 clock hour bundle package to an additional 20 educators. The bundle may be purchased online simply by clicking on the bundle link. This offer won't last, as it reflects a savings of more than $400. Plus, the added advantage of not having to pay ESD fees saves you an additional $300! We will also include the ENTIRE technology CD as a bonus!!! For those looking to renew certification by June 30th, your time is running out. Yes, there's still time - even for credits - but the window is closing fast. For those of you looking for summer courses or to move on the pay-scale, our independent study type courses are perfect, as you may earn clock hours or credit for doing things that are USEFUL to you. Thinks such as moving grade or subject level, creating new lesson plans, working with colleagues on GLE or WASL strategies, reviewing text or library books, bulletin boarding or even traveling - OR whatever is of value to you! Check out our Curriculum Development and Curriculum Alignment courses. There's not a better value anywhere. And, no added ESD fees! Please feel free to share this email with your colleagues and friends. They'll be glad you did! Remember, we also offer the Washington State ISSUES of ABUSE course. This is a simple way to complete this requirement. As always, ALL courses on our website are Washington State Approved Clock Hours in partnership with Freeman School District #358 http://www.freeman.wednet.edu/ and Washington Federation of Independent Schools (WFIS) http://www.wfis.org/resources/services.html . Look for our ads in the WEA's WE publication - and the bright orange cards being delivered to your school! Thank you for your business! For those educators looking to meet the June 30th deadline, or looking to meet payscale advancement by the end of summer, www.my247ed.com is pleased to offer with its Washington State Approved partners; Freeman School District #358 http://www.freeman.wednet.edu and Washington Federation of Independent Schools www.wfis.org, over 375 clock hour courses and 90 credit hour courses. Right now, you can earn 150 clock hours for as little as $850, and you may spread out payments over time. Additionally, any educator enrolling in our 150 clock hour bundle will receive the entire technology bundle as an added bonus to be used as any part of the 150 hours! That's a potential savings of over $450. We also have only 10 Issues of Abuse courses remaining, so if you or someone you know needs this course, get it now at www.my247ed.com. Remember, we offer solutions to fit every educators need - from 3 to 450 clock hours and equivalent credits. Please feel free to share and forward this email with your friends and colleagues. They'll be pleased you did! As always, your satisfaction is our priority, and our partners, <?xml:namespace prefix = st1 />Freeman School District and WFIS, GUARANTEE that all the offerings at www.my247ed.com are accepted by every school district in Washington and OSPI for recertification. As with all our courses, you will pay zero ESD in fees!!! So, get started today and see how easy and useful online and customized professional development can be. Looking to meet the upcoming June 30th re-certification deadline or pay-scale advancement for next year? Look no further and get started NOW! Earning professional development has never been so convenient and actually useful. Courses can be customized to your exact specifications - including CORE courses within the Professional Certification Program for <?xml:namespace prefix = st1 ns = "urn:schemas-microsoft-com:office:smarttags" />Washington State educators. my247ed.com is offering its 150 clock hour bundles starting from $850 or 15 credits from $1500. Reserve your bundle now. You MUST contact us directly or via email to take advantage of this offer. This is an inclusive package, so there are no extra charges! Look for our ad in the WEA publication. Start taking courses that are specifically designed to meet your individual needs and requirements - whether to meet SIP, EALR's, GLE, WASL or other school, setting or state requirements. Courses range from 3 to 450 clock hours and equivalent credits. Check out our Curriculum Development and Curriculum Alignment courses. Don't get left out - and don't let your colleagues struggle to find something to take. Send them to www.my247ed.com and get a professional development solution that makes sense, is useable and does more than just fill a requirement! WFIS member schools, ACSI educators, non-practicing and non-pay-scale advancing public school educators contact us directly at 509-448-0603 or information@my247ed.com for the discounted rate. Alternatively, contact your financial advisor and see how "MAXING" out pay-scale now can positively effect your long term goals. We're always adding new courses and have had many suggestions. A course that we're currently considering is a GPS and waypoint offering. Initially we'd provide the educator with a hand-held GPS, and make sure that the educator is comfortable with it. Then, depending on your interest, would provide you with a classroom set to use. Click here if this is something that interests you, and please let us know if you have suggestions for other courses. Thank you for your interest in my247ed.com. If you have any questions, comments or suggestions, please let us know! As June 30th approaches (for some) or a pay raise is available, www.my247ed.com has a professional development solution specifically customized to meet your individual needs, conveniently and affordably! We're currently offering a super savings on our 150 clock hour bundles of our curriculum development, curriculum alignment and technology courses starting at $750. That's an inclusive price, as are all of our courses. But hurry, this offer is limited to the first 100 educators. There's simply not a better or more convenient way to meet recertification requirements, pay-scale advancement or best yet - earn clock or credit hours doing what's important to YOU! [Click here to reserve your space] Other bundles are also available from 3 hours to 450 clock hours or credits! There's not a better way to customize your professional development that results in you meeting and working toward what will make you a stronger and better educator! You'll now notice when you log into your account that the "myAccount" section has a different look. This was done to make accessing forms and reports as well as "what's next" more intuitive and instructive. Hopefully you'll find it much easier to access your information. View Help Steps. To see it live, please log into your account. Please check the conference center from within your account to log your hours for any of the desired conferences. As always, the flat fee for <?xml:namespace prefix = st1 ns = "urn:schemas-microsoft-com:office:smarttags" />Washington State clock hours is only $10! Please contact my247ed.com directly at 509-448-0603 or click on this link to request WFIS and/or ACSI discounted 3 to 150 clock and credit hour bundles. To view your carry-over hours from the ACSI regional conference(s), please log into your account, scroll down to the conference section to view the number of hours you have earned towards your next CEU. For Washington State educators, clock hours are awarded for the entire conference. As your friends and colleagues are considering professional development options, we appreciate your continued recommendations to the www.my247ed.com website. Please ask them to use your name in the referral field during check-out. When they do, we'd like to be able to compensate you for your recommendation. And don't forget the non-practicing educators that you know too - no one wants a lapsed certificate! As many educators already have, please remember to consider any of the courses that we offer into your professional certification plan. Thank you for your continued business. Please let us know if there is anything that we can do to better assist you in meeting your professional development needs! As the Christmas season is upon us, professional development is probably one of the last items on your mind. However, as your grading papers, writing report cards and developing curriculum this break, you may also earn clock hours or credit for doing many of the same things you're going to be doing already. We have a limited offer for any educator - public, private, practicing or non-practicing educator of 150, 300, 450 clock hour (or equivalent credit hours) starting at just $750. There are NO added fees (except if you elect credit courses versus clock hours). That's a savings of at least $300 over your ESD. Last year we helped thousands of educators meet recertification requirements, meet INDIVIDUAL needs and move on the pay-scale. In fact, the average pay increase from moving on the pay-scale was over $2200. Get started NOW and reap the rewards of USEABLE professional development today, and increased pay come next fall. Please "do the math" and see how starting now - whether you need clock or credit hours - can benefit you in the short term and long term. We even offer 0% payment plans for those that would like to pay over time! Please share us with your colleagues. For every referral that signs up and takes advantage of this offer, you'll receive $25. You can even refer yourself! This is a limited offer to the first 50 educators. To secure your savings, email is@my247ed.com with your name and number of hours or credits you want and/or need. It looks like registration of last weeks conference is going and continues to go extremely well. We have received very few questions, and comments, if any, have been very positive. Before sending you the link to generate your forms, I wanted to talk with Roger Norrie concerning hours beyond 6 hours (1 CEU) and 11.5 hours (still just 1 CEU). Our discussion resulted in a slight change so that our system will be able to "carry-over" the hours from the 2005 convention to future conventions. This should be great news for everyone. Finally, as I have reviewed nearly 300 registrations, there seems to be some confusion about the evaluation form. Because the forms that we generate are also used for state certification, there are state requirements requiring an evaluation be collected regardless if an evaluation has been done within the individual sessions. Please feel free to "zip" right through it, as the session evaluations are with ACSI staff already. Additionally, we will forward comments from our system to ACSI as well. Looking for something complimentary and desired to meet YOUR classroom, school and district needs this year? Not just something that's not just "available" but will result in you becoming a stronger educator and your students achieving more? Don't just take a course to take a course from what's out there or take something because everyone else is. We'd like to suggest that you take a look at our more than 300 courses for clock hours and/or credit hours. There's something there for everyone at www.my247ed.com. With more than 3,000 completely satisfied educators throughout <?xml:namespace prefix = st1 ns = "urn:schemas-microsoft-com:office:smarttags" />Washington alone, you're in great company when using www.my247ed.com. For example, if you'd benefit more from classroom organization or curriculum development and alignment or the Issues of Abuse course, than traveling across the state or city - or finding out that something's been cancelled, then please consider from our vast catalog of online and offline courses. There is NO traveling required nor do you spend hours of time in front of the computer. We specialize in meeting YOUR exact needs, whether that's with an independent study type course for 3 to 300 hours (or credit) or a guided course for 3-300 hours (or credit) we've got you covered. Want to earn up to 300 clock hours (or credit) for your Professional Growth Plan? We can do that too. It's very easy for us to map your goals and objectives plan to courses that will result in YOU making the desired enhancements that you want or need to. Remember as always, ANY Washington State approved clock hour in-service and/or conference is only $10 with www.my247ed.com. Stop paying the arbitrary "by-the-hour" fees, and save a lot of YOUR own MONEY. Educators will pay more than $2 MILLION dollars in unnecessary ESD fees this year alone. See our ads in the WEA Magazine. You will not find our information in the ESD catalogs or newsletters as before, as the ESD promotes only its own revenue producing offerings. Professional development is about meeting YOUR needs, and we understand that COMPLETLY. Thank you for you for considering www.my247ed.com and your business! We look forward to assisting you in meeting YOUR professional growth needs! If you have any questions, suggestions or comments, please feel free to contact us via the info below. And, please share us with your colleagues. We get literally hundreds of educators wishing that that they knew about us and our services earlier! We want to remind you that we offer many great and useful classes to help you fulfill your professional development needs. As the year starts, professional development is often put on hold until the year sets in. As educators ourselves, we do understand that. However, please consider several of our courses - especially the independent study type courses, our curriculum development courses and our curriculum alignment courses, all available from 20 to 50 clock hours or in credit form. It's a perfect way for you to couple your year's goals and objectives that you set for yourself while meeting school, district and state goals! Plus, you can attend any professional development offering anywhere, offered by anyone, your district, the ESD, OSPI or courses offered in another state. The best part is that you don't pay any $2 per hour fees, nor do you have to haul around a folder full of professional development receipts. And it gets better. In addition to being able to select courses based on your specific individual needs versus what's currently available (and not cancelled), you may even earn hours for the actual implementation of your learning. How many times do you go to a conference or in-service and that time do becomes the totality of the professional development? Probably more that we'd want to admit. Here's the perfect opportunity to couple new learning with implementation. We call it, professional development you can use! Get enrolled now, and start earning clock hours that make you a better instructor and result in your students' higher achievement. Space is limited - 50 clock hour bundles start at $450 and 100 clock hour bundles start at $750. Contact is@my247ed.com to reserve your self a spot today. We can also stretch payments over time at 0% for those that request it. It's a great way to earn professional development hours to meet personal, school, district and state goals while meeting recertification and pay scale advancement requirements at the same time. You comments and suggestions are always welcome. Thank you for your consideration and your business. There's still time to earn 3 to 300 clock hours (or 1-15 credits) prior to the September 30th pay-scale deadline. If you've put off hours until now, or know of other educator colleagues that have, now is the time to get started. 100 clock hour bundle packages are again available from just $750. This is a limited time offer. Click is@my247ed.com to reserve a bundle now. Don't delay! Get your start date established today, and start earning clock hours for the pre-school year planning, bulletin boarding, lesson planning, curriculum development and alignment, school and site improvement planning, personal growth planning and more! Plus, unlike other organizations, you don't have to pay any additional fees for the clock hours themselves! The bundles are limited, and time is very limited, so get started TODAY! Also, payment plans are available so you don't need to pay all at once. Contact information@my247ed.com for more information and to reserve a bundle. Great summer specials and bundles are still available at www.my247ed.com. Take a look at Washington's largest provider of Washington State Approved clock-hours and see just how easy and useful our on-and-offline courses are! Right now save by clicking the iPOD link on the Washington home page to receive a discount code for use on any of our individual courses and to see if you've won an Apple iPOD. But hurry, this offer will expire soon. For those looking for last minute clock-hours or credits for pay-scale advancement and or certification purposes we offer great bundle pricing on 20 to 450 clock-hours or 1 to 45 credits. BUT, we can't do anything for you until you enroll, which establishes your start date! August Special: 100 clock-hours for $750. This offer is limited to the first 20 educators. Additional increments of 10 to 100 clock-hours are also available upon request. To ensure that a bundle is available for you, please email is@my247ed.com and request the AUGUST BUNDLE. If you require additional clock-hours or credits, please include the number needed. Or, call us at 509-448-0603. We limited our last 100 clock-hour bundles to the first 30 educators and we sold out in two days. And remember; see the conference center for "flat-fee" conference pricing. You'll save BIG! Right now you can earn 100 clock hours for as little as $650. There are no additional ESD fees (a savings of at least $200), no added text or supply fees or anything. What better way to earn a significant and useful number of clock hours or credits quickly, easily and conveniently! This is a limited time offer and available to the first 30 educators. Click on this email link is@my247ed.com to request one of our limited bundle offers. Simply state that you'd like the 100 hours for $650 along with your name and contact number and we'll get you set up. It's that easy. If you're spending time in or for your classrooms at all this summer, or you're implementing new learning or creating or enhancing your curriculum, we offer several great courses for both clock hours and credit to fit your individual needs. See our Curriculum Development Courses and our Curriculum Alignment Courses for earning 20 to 450 EALR, GLE, WASL and NCLB focused clock hours or credits, this SUMMER! Unlike traditional professional development, these courses may be taken multiple times, as each course is specific to your individual needs. If you take any course this summer, these are the courses to take, as you're compensated for your time doing those activities that make you the best educator possible. We've had nearly 200 educators from around the state take a combination of these courses and the feedback has been outstanding. Now you can actually earn clock hours or credits that relate to your exacting needs. Think of it like this: Define what it is that you wish to accomplish over the course of 20 to 450 hours. We'll then package a course bundle for you using our courses and any other courses that you need or desire, from your ESD, OSPI or district offerings, including conferences both in and out of state. Plus, you'll never have to pay for another clock-hour again - regardless of what or where you take the offering! Visit www.my247ed.com to get enrolled. It's that simple! No tedious papers to write no wasted time just to get your hours and you're taking and doing things that are useful to you and result in better meeting your students needs. These courses are available as self guided or guided by one or more of our 15+ Master educators and allow you to work at your convenience and pace anytime and anywhere - you are NOT required to be online or drive anywhere! Tell you friends; tell your colleagues and co-workers. It's exactly what professional development should be! Per the WAC, all clock hour and credit hour courses may be used for salary purposes. Earning a raise has never been faster, easier or more rewarding. Contact www.my247ed.com at 509-448-0603 or information@my247ed.com. We're happy to assist you in meeting your individual needs and requirements. OR, for a bundled price at a significant savings, contact us directly. This message (including any attachments) may contain confidential information intended for a specific individual and purpose, and is protected by law. If you are not the intended recipient, you should delete this message. Any disclosure, copying, or distribution of this message, or the taking of any action based on it, is strictly prohibited. Don't spend your summer doing school related work where you aren't earning hours! Now you can. - and don't keep it a secret. Tell your educator friends and colleagues too! · Creating and aligning lessons using the school and districts expectations mapped to the state requirements for Essential Learning and GLE's. Earn clock-hours or credit for summer curriculum development. It's a perfect match for what you're most likely going to be doing already this summer, with the exception that you can now earn clock hours or credit for curriculum development and alignment. What could be more beneficial and rewarding to you as an educator than to be compensated for your summer work? Professional Development that you can use! Educators can't believe that they can earn clock hours and credits developing activities for something they can actually use! Earn 20, 30, 50, 100, 200, 300, 450 clock hours or credits. Discount Code: currdev20, currdev30, currdev40, currdev50. If you need want over 50, contact information@my247ed.com for a bundled discount rate. The Ultimate Professional Growth and Development Opportunity. Define what you need to do. What's your need for professional development? Is it spending 8 hours at a conference where only 1-hour is useful? That's not quality professional development - not ever. Work with and design the goals and objectives that you set for yourself. In addition, you'll have access to one of our more than 10 master educators and administrators, if/as needed. These goals are specific to your exacting needs, with a product that you developed to be USED. Outcomes. A product that you can use, that will map perfectly to school, district and state standards with an emphasis on improving and increased student learning. Your product is only submitted (turned in) if you're taking the course for credit. integrate the content into my curriculum this summer. Can I earn clock hours for this? A. YES. A perfect fit. A. Absolutely, if it's part of your plan that you've defined. It can even extend into using that technology in all the other curriculum areas as it relates to the state learning requirements and GLE's. Q: Is there a limit on the number of hours that I can earn or time I take this course? A: No. There's no limit, because you may decide to do something very similar in another academic area. For example, going from a standard English curriculum to an AP English curriculum - these will be very different. Q: How long do I have to finish? A: As long as you want, but generally under a year. But, it's hours based. So, 10 hours can be easily completed in a single day. It's up to you. Q: I have never heard of a program like this, is this new? How do you do it? A: Yes, it's somewhat new. We like to think of it as an IEP for the educator. It helps to direct the educator on an individual level to meet his or her own professional development needs. Traditional professional development is much more one-size-fits-all. Our staff of highly qualified teachers and administrators understand education and the educational needs of educators as well as anyone - this is an example of such understanding that make professional development worth something to YOU and your students! Q: Can I sign-up for this course after I have completed what I wanted to do? A: You need to enroll prior to beginning the work you intend to do. Q: Can I take the FREE class more than once? A No, but you can take it in logical increments of 20 to 50 clock hours at a time. Q: Is anyone else in Washington offering something like this? A: No. Unlike other providers, our content and services are specific for your individual situation and your individual needs. We even create courses for just a single educator with a specific need! Thank you for your time! Enjoy learning (and earning hours for it) this summer! All OSPI Summer Conferences (Wenatchee, Tacoma, Vancouver, Spokane) are approved as clock hours and are available for a flat $10 fee for up to 26 hours each at www.my247ed.com. Compared to your ESD's $2 per hour fee, the savings could amount to more than $40! Go to www.my247ed.com, choose Washington and then Conferences in the upper left corner. The process takes about 30 seconds and you're done! Getting clock hours has never been easier. Thank you for your business and sharing our services with your colleagues! Why? OSPI is very particular about making sure that the provider or sponsor (as listed on the form) is "approved". www.my247ed.com is not the approved sponsor, but all the content and courses on our site are "APPROVED". This is achieved by partnering solely with Washington approved sponsors or providers - like WFIS, Freeman School District, Seattle University and others. In short, if you do NOT use our pre-filled forms, then make sure that you correctly state the sponsor/provider on the form exactly how it's stated in our forms. Otherwise, your renewal packet may be returned to you by OSPI. REMEMBER, you can now earn clock hours and credit hours for curriculum development and alignment! See how easy it is and how much more valuable professional development that means something to you and your students can be while earning 50 to 450 hours this summer! PLUS -No traveling! Visit www.my247ed.com for more information. We're pleased to announce that the 3-day Blaine Ray - TPR Storytelling Workshop* in Seattle on June 27-29 has been approved for clock hours! Please visit http://www.blaineraytprs.com for more information or to register for the TPR Storytelling Workshop. For those already registered or will be registering for the TPR Storytelling Workshop, and want clock hours, please go to www.my247ed.com and select the conference center from the upper left. Then choose the appropriate conference. The directions are self-explanatory and should take about 30 seconds to complete. *The upcoming Spokane Workshop has also been approved. With my247ed.com we offer online courses to meet ever need, including clock-hours for lesson planning and development - something you're probably going to do already! For those of you that CANNOT take any more courses prior to June 30th, register now for our summer courses, save an additional 10%, and have access to your courses immediately on July 1st. See why thousands of Educators are using and switching to my247ed.com for all their professional development needs! Look for our new catalogs in your schools this week, of online at www.my247ed.com. Thank you for your business and sharing us with your colleagues! With my247ed.com's great offerings you'll never look at professional development the same way! Remember, ALL 24/7 Educational Courses are Approved Washington State Clock Hours or Credit Hours and GRANTED by one or more of the following: WFIS, Freeman School District, Seattle University or any of the more than 2,000+ Washington State Approved Providers. View OSPI Memorandum from Larry Davis, Executive Director BOE and Approval Guarantee. 24/7 Educational Services LLC (www.my247ed.com) has added 150 new course selections! We're pleased to offer Washington State educators nearly 400 APPROVED Washington State clock hour courses and nearly 100 credit hour courses. With the addition of these new courses and already existing courses, www.my247ed.com offers Washington educators the largest, most diverse, convenient and useful courses anywhere in the State. These new courses provide the new or experienced educator the ability to earn clock hours or credits as they prepare for their classrooms this summer and next year. These courses range from 5 to 150 to 450 clock hours and provide the educator with useful, timely and relevant classroom, school, setting and/or district management, instructional opportunities and experiences. The courses are competitively priced with your locally offered clock hours, and start at just $30, but with two exceptions - there are NO added ESD or District fees AND courses are available in an on-line and off-line format that can be taken wherever you are - whenever you want! That means NO driving, and NO rearranging your summer schedule, NO schedule - period! Best of all, these courses result in a product that you can use in your own classroom, school or setting - NO busy work! As you're thinking about courses that you WANT to take for the June 30th deadline and/or preparing for courses to take this summer, please consider www.my247ed.com for all of you educational needs! Thank you for your consideration and sharing this email, our website and our catalog with your colleagues. https://www.my247ed.com/catalog/catalog3.pdf (paper catalog without new courses). We appreciate your business and look forward to helping you meet and exceed your educational needs and requirements. Please let us know if you have any questions or suggestions! Lesson Planning: Hasn't this been done before? What others are doing. How does that Fit? Assessing Theory - Does it Work? The end of the school year is near, and the countdown numbers probably aren't coming down fast enough. The last thing you want or need to be worried about is your re-certification - yet NOW is the best time to start, if you haven't already, and certainly the best time to SAVE! Feel free to share this email with your colleagues and see how to earn a $10 Amazon Gift Card. See below. For many, www.my247ed.com will be the best and last hope to keep that certificate current - we've helped hundreds of educators who were in a pinch. June 30th is quickly approaching. For those of you that still have requirements to meet - whether as clock hours, credit hours or the Issues of Abuse class, right NOW is the best time to get your re-certification requirement met! We offer great courses that require ZERO busywork as both guided and self-directed courses. So, if you have some or all of your 150 clock hours or 1-15 of your credit hours needed - call, email or sign-up right now, as the clock is ticking. Because our courses are constantly updated, you can take many of our courses as often as you like! For example you take; Curriculum Development: Meeting your Students Needs, Curriculum Alignment: Putting Theory into Practice, Creating or Enhancing a Pro-Dev Course for 20, 30, 40 or 50 hours, and you can take the same thing again but either to supplement what you just created or to add a content area like math, reading, social studies or PE, among others. There is no maximum. It doesn't get much simpler than that. Plus, get a product that you can use in your classroom or school setting! How close are you? Have you calculated how much money you're losing each year and in retirement? Now is the best time to get started on your next raise. Whether your school accepts clock or credit hours, my247ed.com has you covered. It's never been easier or less expensive to "MAX OUT" on the pay scale. Don't spend your time now or this summer driving to courses, or rearranging your summer to accommodate courses that turn out to be cancelled. Take the courses you want and need at your convenience without ever leaving your home - or wherever. Summer is also great time too work towards that pay raise. With over 90 credit courses and 200 clock hour courses, adding 150, 350 or 450 clock hours has never been easier. Even better there are NO ESD fees! Go to www.my247ed.com to enroll. For educators wanting to enroll or work in groups of 3 or more, group discounts are available. Using the group discount you can save as much as 30% - more in some cases. Contact groups@my247ed.com with the course or courses and the contact information for the group coordinator. For a limited time, recommend a co-worker, colleague or educator friend to www.my247ed.com and receive a $10 Amazon Gift Card when they use your name in the "referred by" field during a course enrollment. Referral notification after verification is generally available within 24 hours. There is no limit to the number of gift cards you can receive. WFIS school members, contact wfis@my247ed.com for your "member" discount code. Now available for 15 clock hours or 1 quarter credit is Dan Otter's, Teach and Retire Rich, course and text. Learn how to decipher your retirement plan and how your investments are stacking up. Teach and Retire Rich? On these salaries? Are you kidding me? In this online course, author and teacher Dan Otter lays out exactly how educators can reap the intrinsic and extrinsic rewards of the profession. Utilizing his book Teach and Retire Rich as a guide, you will learn about the powerful wealth-building tools available to teachers, and how to take advantage of them. Fundamental retirement saving concepts are taught in a user-friendly manner and illustrated with stories about teachers who have taught and retired rich or are well on their way. The nation is rapidly moving toward an "ownership society" in which the individual must manage most aspects of his or her retirement savings. This course will ensure that No Teacher Will Be Financially Left Behind. See Finance for Educators in the main catalog. Use the discount code: TRR05 and save $25 on 15 clock or 1 credit. For those educators requiring 3 to 150 or 1-15 credits by June 30th (or colleagues), my247ed.com provides the best and most convenient way to accommodate almost every need. Need to move on the pay scale? 150, 300, 450 clock hours or 1-45 credits? No problem. Don't spend all your time and money driving all over for a 3 to 10 hour course. Simply log in to www.my247ed.com and begin earning clock hours or credit. It's simple, easy, convenient and best of all APPROVED statewide (with our partners) - offering over 180 courses. See why we're Washington's most comprehensive source for professional development! And remember NO additional ESD FEES! Where else can you get 24 hours in just 1 day? Many of the courses we offer may be taken as often as you'd like - for clock-hours or credit. The ISSUES of ABUSE course is very popular for those needing it - and you're done in a day (if you want). Independent Study courses are again available. Click on Independent Study from the course catalog for more information. As always, you questions, comments and suggestions are welcome! Look for our newest catalog in your school in May! Do you have a June 30th expiration for your certificate? Need clock or credit hours? Right now is a great time to get started, especially with the savings. How close are you to the next pay level? Do you need 15 or more credits or 150 or more clock hours? It's extremely easy - no travel required, no "busy work" -just great professional development to meet your exacting needs in logical and easy 30-50 hour increments! During this 7-day sale, 150 clock-hours start at just $1250* which is inclusive of all fees. There are no ESD fees, no transcript fees, and no additional instructor fees. Compare that to your ESD. The clock-hour fees alone will cost you a minimum of $300- plus course fees, plus instructor fees, plus material fees, plus travel! CLICK here to reserve your spot. *The $1250 is a limited time offer and available to the first 20 educators that respond to this email. See our ads in the WEA's monthly publication and look four our newest 12-page full color catalog in your schools the first week of May. Remember you're invited to submit educational related articles for inclusion in our catalog. It's a great way to get published! We appreciate your continued referrals to your colleagues! Go to www.my247ed.com, select Washington and then select "Conference Center" in the upper left corner. It's that easy. Can't attend the whole conference? No problem - as long as you attend 3-hours, you'll receive your hours. Increments are 3 to 15 clock hours in ½ hour increments! Planning on implementing the strategies presented at this or any conference? If so, you may earn additional clock hours or credit hours! e-mail information@my247ed.com for more information. <?xml:namespace prefix = o ns = "urn:schemas-microsoft-com:office:office" />NCCE Technology Conference only $10 for ALL clock hours! For those of you attending the 2005 NCCE Conference in Seattle this week, all clock-hours - up to 35.75 are only $10. Go to www.my247ed.com and click on the NCCE link. It really is that simple! These are Washington State APPROVED clock-hours, EXACTLY the same as those provided by your ESD - guaranteed! Do you prefer credit instead - or additional clock hours? We can enroll you in one of our many different credit (or clock hour) courses to compliment and extend the learning you were exposed to at the NCCE. Our learning philosophy is simple; Professional development doesn't end with a conference or in-service, it just begins! Contact information@my247ed.com for more information on specific sessions and topics that YOU have an interest in. Thank you. Enjoy your learning -- for less!!! Please note that the CORRECT date for savings is Friday March 11th. For the next 3 days - through Friday, March 4th, we're running a 15% savings special on all of our courses (excluding pre-registration and pre-bundled courses). Don't forget to share this information with your colleagues or those that are scrambling for meaningful clock or credit hour courses. It's been you comments on the evaluations, emails sent and voice conversations with us that are the best testimonials to the courses, their quality, the convenience and actual usefulness that tells us that the more educators that know about our courses may actually take a course! Plus, more than 90% that have experienced our courses and services, continue to take courses and use our services. Thank you! This discount code may be used on as many different courses as you'd like, including our 50 clock-hour independent study courses. For credit hour courses, the discount still applies, but the credits themselves are not discounted. Remember this discount ends on Friday. And don't forget, the NCCE Conference clock-hours are only $10 for up to 35 clock-hours! See www.my247ed.com for the link in the featured section. As usual, if you have any questions OR to request copies of our newest full-color catalog to be delivered to you, please don't hesitate to contact us at www.my247ed.com or 509-448-0603. New courses are being added weekly! To log your clock hours and to pay a flat-fee of $10 instead of the arbitrary per-hour fee of your ESD, simply go to www.my247ed.com, go to Washington, click on the OSPI January Conference link. It's that simple. You might ask, "What's the difference between the clock hours the ESD offers and with my247ed on behalf of its Approved Sponsors?" The only difference is who the 'Approved Provider" is and how much they charge. That's it! In many cases your ESD may have set arbitrary and disproportionate per-hour fees for its maintenance of clock hours - generally $2 per hour. However, the same piece of paper is filed regardless of the number of clock hours you take. Educators take note: The ESD's are very protective of their "clock hour monopoly", as your lack-of-choice generates approximately $2+ million per year in clock hour fees. It's your money. You choose. Thank you for your continued business. We look forward to working with you and saving you your hard-earned money. Questions, comments or suggestions - please feel free to contact us at the address below. www.my247ed.com is pleased to announce that it will shortly be changing its homepage to include several more exceptional clock-hour and credit hour courses for educators seeking timely, relevant and convenient professional development opportunities. This change will occur this evening - January 4th. In addition, because of your comments, referrals and the quality of the courses we offer, www.my247ed.com professional development courses and services are now available not only to educators in Washington, but also Oregon, Idaho, Alaska and New York - and there's more to come. One of the key components that make www.my247ed.com stand out from other professional development providers and ESD's is the PDMS (Professional Development Management System). This system integrates all your professional development courses, classes and workshops - both credit and clock-hours from anywhere into a simple to use web-based solution. Combined with the courses www.my247ed.com offers, or clock-hour courses taken elsewhere where you choose the flat $10 clock-hour fee through www.my247ed.com (compared to the $2 per hour fee), all your courses, records and reports are available to you 24 hours a day, 7 days a week for 7 years. No lost receipts, no transcript fees and no hassles - guaranteed! Your forms are automatically pre-filled for you, including the Application for Renewal. Now, keeping your certification current and the re-certification process has never been easier or more convenient. We sincerely thank you for your continued business and for choosing www.my247ed.com for your professional development solutions. We look forward to continuing to provide you and your colleagues with great offerings. Please let us know if you have any comments, questions or suggestions! By now you know the quality and the convenience of our courses and services, whether for clock, credit or conference hours or for the organization of all your records in one simple to use location. For a limited time, you can earn a $20 Amazon gift card for any course* that you take OR any course* that is enrolled in today through December 23th 2004! What to do: Simply have your referral enter your name as the referrer in "referred by" field on the payment page - do the same thing for yourself! It's that simple. Gift cards will be available each Friday in electronic form. Or, if you prefer, a paper certificate is also available. There is no limit to the number of gift cards you can receive. In fact, if 5 or more referrals take one of our courses* you'll receive an additional $50 gift card in addition to the 5 - $20 gift cards! Remember, with our Curriculum Development or Curriculum Alignment courses you can earn clock or credit hours for what you may already be doing. In addition, make sure that you never pay more than $10 for any clock-hours. Simply use the "red" link off the www.my247ed.com site to record and pay for your hours to ensure that you have access to your clock-hours forms 24 hours a day, 7 days a week for the next 7-years. No lost receipts, no transcript fees! The process takes about 30 seconds. If you have questions, comments or suggestions, please feel free to contact me directly. We thank you for your business and we look forward to your continued referrals. For a limited time, you can earn a $20 Amazon gift card for any course* that you take OR any course* that is taken by someone you refer between November 10th and December 15th 2004! You may now pay for ANY in-service, regardless of whom or where it's presented at www.my247ed.com - click on the red link, on the right of our homepage! In addition, to the more than 150 approved clock-hour and credit hour courses we offer, we can get approval and create a course to a single individuals specific to need. That's right, we'll create a course for a single educator or as many that have the same or similar needs! Need same day clock-hour approval for your activity? We can handle that too! Contact information@my247ed.com for more info. Q: Is there any difference between the clock-hours my247ed.com offers and others, like a district or ESD? A: Absolutely NONE! Clock-hours are exactly the same as long as they're granted by an approved provider per the WAC. Our various educational partners approve ALL my247ed.com offerings. Therefore, any and all of our offerings are recognized by the state in every school, and school district statewide. Q: Why are my247ed.com clock-hours so much less expensive than others charging by-the-hour? A: Clock-hours are only paid for by-the-hour because, that's the way it's always been! Clock-hours are nothing more than filing and recording your attendance. my247ed.com recognizes that since ONLY YOU may pay for clock-hours, you should have a choice - and be called what it is: a filing fee - regardless of the time. To make our system even better, we are performing some routine maintenance and an upgrade to the servers. During the next few days, as these changes will take place, you should not experience any issues, but, if you do, please let us know immediately. No data will be lost. Plus, let us know if you have a suggestion. Several enhancements have already been made based on your ideas! Better services, better prices - GUARANTEED! We forgot to mention two important items! Any of our courses taken with the discount code: october8 - also receive a FREE lunch up to $10. In fact, if you don't find our clock-hour reporting and tracking service one of the most convenient, efficient and least cumbersome processes, we want to hear from you. Mind you, that thousands of educators have used my247ed.com and have reported back to us that this - our system - has made their professional development significantly less difficult. No lost papers, no lost receipts, no transcript fees - no hassles, just 24 hour, 7 day a week online access to your records - we even provide tax reports for your records and the pre-filled State re-certification form (even the correct circles circled) - just print - all at NO CHARGE! Here's a question we often get - "Do the ESD's know about this?" Absolutely! We invited them to work with us to make the clock-hour process easier, more convenient and less costly for you. You can read the Press Release from January, 2004. Their actions and reactions to making the process more convenient and less costly to you will be self-evident as they continue to charge you $2+ per hour when they KNOW that collecting for clock-hours is only a fee for filing a piece of paper! But, please don't get upset with the ESD staff telling you that you have to pay or else... Like so many in the ESD offices, they aren't likely even educators - and they're just doing it like they've done it for the last 17 years. That's it! Have a great professional development day. Great News! In addition to offering nearly all our courses at a discount tomorrow, using the discount code: october8 - we are now able to offer you FLAT fee clock-hours for ANY professional development opportunity you take. That's right! Up to 20* clock-hours is now only $10. That saves you substantially over the fees paid to other clock-hour providers/collectors. So, don't be caught paying more for fewer and less convenient services. Unlike others arbitrary $2 by-the-hour charge, additional charges for transcripts, lost receipt charge(s) - we do away with all of that. The process takes about 30 seconds and you're done! It couldn't be easier or more convenient. With my247ed.com, you get the exact same clock-hours, in addition to FREE transcripts, FREE receipts and 24 hour, 7 day a week access to YOUR records - all for only $10. No strings attached! *earn up to an additional 3 clock-hours for integration of your learning into your classroom, school, or district as it relates to the state EALRS and GLE's. See linked description above for more information. On October 8th, any course you take with us, in addition to being discounted (using the discount code: october8) receives a FREE lunch - up to $10. No stings attached. If your district or ESD charges you an arbitrary and unnecessary by-the-hour (like $2 per hour) fee, DO NOT pay for them - unless you want to waste your money. Simply visit this link - FLAT FEE $10 (click) - anytime, during or after your in-service. In addition to any hours* you take, you may earn up to an additional 3 free hours as you consider how to integrate your learning into your curriculum. Give it a try. Your satisfaction is guaranteed. In fact, we're so sure you'll like this process; we'll refund you $5 of the $10 fee! That's right, up to 20 clock-hours for only $5. See how online organization of your records simplifies the tedious, cumbersome and costly paperwork process imposed needlessly by other providers. Want credit instead of clock-hours? Contact information@my247ed.com to see how you can convert what you may be already planning to do into credit! Don't be fooled or misled. All clock-hours are exactly the same! 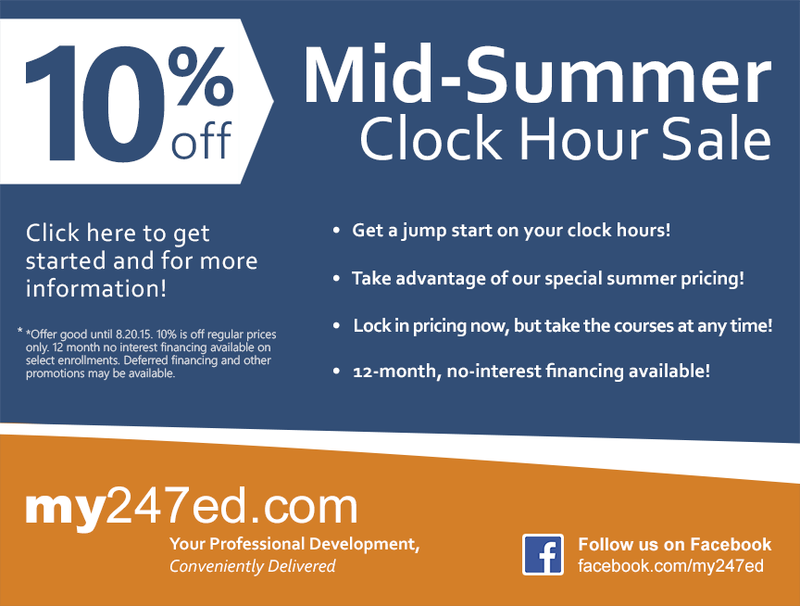 See why my247ed.com educators are getting their clock-hours for a fraction of the price and often FREE in comparison to your ESD. We genuinely appreciate your business and are happy to assist you in meeting your specific needs. We simply make the process better, smarter and less expensive! Why? Unlike your ESD, my247ed.com is completely made up of educators and administrators, so we know the process inside and out! Please feel free to share this email with your colleagues! *Your actual time may not include: non-working lunch, general and routine staff meetings, transition time and the like. Remember, both online AND offline time count! - for any of our courses. So don't think you need to be sitting in front of your computer! Clock-hours have never been more convenient! We even offer retroactive clock-hours! Curriculum Day - October 8th - take one of our courses and we'll pay for your lunch! Plus, take the course of YOUR choice at YOUR convenience! Thank you for your continued business and your referrals! And you pay NO arbitrary ESD fees!!! For those of you with an October 1st deadline for an upward move on your district's pay-scale, there's still time to earn plenty of clock-hours (or credit hours). We have courses specifically designed to meet your needs. Please visit our website www.my247ed.com for more information and to view the course catalog. Completion records for clock-hour courses are available within 4 hours of completion (generally sooner). A reminder too, that for the October 8th statewide in-service offerings, all of our courses will be on sale (and FREE lunch). Records will be available (if needed) to your district for that day, BUT you can choose when to enroll, start or take the course(s) at anytime - it doesn't have to be during the daytime! If you have any questions or comments, please don't hesitate to contact us at the numbers and addresses below. As always, please feel free to share this email with your colleagues - you wouldn't believe how many educators WISH that they had known about our courses and services sooner!!!! my247ed.com is pleased to offer the following for the upcoming October in-service day(s) - October 7, 8 2004 (depending on your district). DO NOT LET YOUR ESD DICTATE YOUR PROFESSIONAL DEVELOPMENT OPTIONS! Don't worry about your class choice being cancelled by the ESD. At my247ed.com we don't cancel our courses, and we don't actively limit your choices! YOUR SATISFACTION IS GUARANTEED! View our catalog of over 150 approved clock-hour and credit-hour courses. Including, "Curriculum Development - Meeting your Students' Needs", "Curriculum Alignment - Putting Theory into Practice" and "Creating or Enhancing a Professional Development or In-Service Course". Need the Issues of Abuse Course? What a great time to SAVE and start. You control your schedule - no set times! Free transcript and no ESD fees!!! We'll even pay for your lunch, up to $10! YOUR SATISFACTION IS GUARANTEED! In support of our commitment to provide personalized educator-centric service to you, the clock hour offering for ANY in-service offering taken ANYWHERE for this in-service is only $5! No arbitrary ESD or district fees and no transcript fees YOUR SATISFACTION IS GUARANTEED! Did your school or district not get its in-service approved ahead of time or do you need to get something set-up NOW? We've got you covered! NO ESD fees, NO cumbersome approval process, NO paperwork, we do it all! See how simple it really is. YOUR SATISFACTION IS GUARANTEED! - visit www.my247ed.com or contact information@my247ed.com for more information. Groups of 10 or more, please contact us directly for additional discounts and to make lunch arrangements! We appreciate your business, and encourage you to look for our Ads in the WEA's publication, WE. Please feel free to distribute this email to your colleagues. If your ESD provides you with false or misleading information regarding 24/7 Educational Services, and insists that you may ONLY pay them please contact us immediately and then ask them, "why are they charging a per hour fee for filing the same piece of paper!?" It's simple, fees associated with clock-hours are for tracking and recording only. Clock-hours are elective, and therefore an organization like the ESD cannot "bank" on fees being collected regardless of what they may say. Hence, registration fees are generally associated with in-services. In addition the SBE's Attorney General has already stated in written form that the ESD may not act in a monopolistic manner. www.my247ed.com can offer clock hour services for educators due to our partnerships with approved sponsors, as per the WAC. FINALLY, you have a choice! Looking to move on the pay scale more quickly, begin or resume your next 5-year re-certification requirement, or just complete some last minute hours? If so, www.my247ed.com has you covered, and saves you over $300 in ESD fees alone. Hurry, this is a limited time offer, and may not be repeated! Contact information@my247ed.com to request and begin your customized independent study type courses. Other customized clock-hour packages also available! We look forward to helping you meet and exceed your educational needs. OSPI Summer Institute - APPROVED! Please note that the OSPI Summer Institute has been approved for up to 20 clock-hours for the conference and an additional 7 hours for the pre-conference. For both a total of 27 hours. In your registration packets you will find that PSESD will charge you an arbitrary $2 per hour. The my247ed.com price is FREE - a savings of up to $54! There is absolutely no difference between PSESD clock-hours and my247ed.com clock-hours (except price, service and convenience), as both are approved per and granted per the WAC - and every school, district, and OSPI accepts both statewide. It's your money, your convenience, and your choice! Your satisfaction is guaranteed. Thank you for choosing my247ed.com. And thank you for your business! my247ed.com - your one stop for all your professional development needs and services! We hope that you've had a great summer so far, but the next school year is just around the corner. Many of you took courses to meet the June 30th deadline, and huge numbers of educators have been taking courses and classes this summer. We hope that you've found the delivery convenient and the content of interest to you. From the phone calls we have taken to the emails we have received there seems to be quite a lot of satisfied educators who have taken our courses - whether for clock-hours or credit. Earn clock-hours or credit for preparing for the new year. You can complete your 150 clock-hour requirement with 3 courses - and you're done for the next 5 years! This summer we have been talking with many different colleges and universities throughout the state about our offerings. What is readily apparent to them and us is that while the state is advocating and requiring PGP's, educators, schools and districts are not doing so in context of what colleges or universities may be offering that quarter, semester, year or at all. That's why many higher educational entities are looking elsewhere to fulfill students' needs. That's where my247ed.com comes into play. In addition to the college and university catalogs, the often-cancelled ESD offerings, we offer an additional 150 (and growing) courses and classes that may be used to meet your needs exactly. Create Your Own Professional Development Package - Clock or Credit Hours! Need 20, 50, 100 or 150 clock-hours, 1 to 15 credits or more for re-certification or pay scale advancement? We'll work with you to create your own individualized independent study type program. Forms and Reports - Organizing Your Records Has Never Been Easier - and it's FREE! Please make sure you take advantage of the forms and reports section of your account. There you will find all of your course completion forms - signed and ready to go. This includes your completion form(s)/transcript AND the state re-certification form. In addition you may record ALL of your other courses (clock-hour and credit) there so they're pre-filled on the state re-certification form - you just sign and turn in to the ESD or OSPI! Summer Institutes and all other in-services, workshops, etc. Many of you have had questions about the Summer Institutes and other in-services being offered throughout the state this summer. Remember, we offer an EXCLUSIVE flat fee service for ANY clock-hour event taken ANYWHERE, regardless of the length from 3 to 20 clock-hours for only $10. Compare that with the arbitrary $2 per hour fee you ESD charges you and you'll save substantially - every time! This includes tracking, recording and the granting of clock-hours per the WAC. Is your ESD continuing to mislead you when it comes to ESD clock-hour fees? It's the same piece of paper being filed whether 3 or 50 clock-hours, so why are you paying per hour? STOP paying ridiculous and arbitrary ESD clock-hour fees! Your suggestions, comments and questions are welcomed.